There is a wide and growing partisan gap in the U.S. over how much government should spend for scientific research. Six-in-ten Democrats and Democratic-leaning independents back increased federal spending for scientific research, up from 46% four years ago. 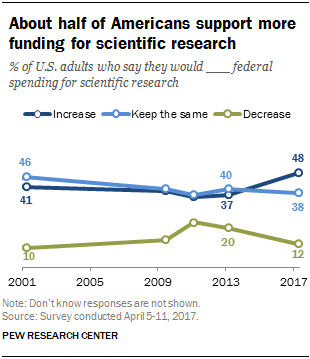 But just a third of Republicans and Republican leaners support increased spending for scientific research today, up modestly from 25% in 2013. Among the public overall, 48% of Americans say they would increase spending for scientific research, according to a Pew Research Center survey conducted in April, up 11 percentage points since 2013. Just 12% of Americans say scientific research funding should be decreased, and roughly four-in-ten (38%) think it should stay the same. 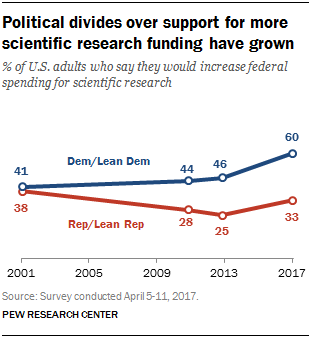 The partisan gap in views of spending for scientific research has grown steadily over time. In 2001, there was no significant divide between parties over federal spending for scientific research. Since then, Republican support trended steadily downward before a modest uptick in recent years, while Democratic support remained relatively steady before rising significantly in the current survey. The partisan gap in support for more spending was 16 percentage points in 2011 and now stands at 27 points. President Donald Trump’s proposed budget in March raised the possibility of deep funding cuts for a number of federal agencies with science research missions, including the Environmental Protection Agency, the National Institutes of Health, the National Science Foundation and NASA. According to analysis by the American Association for the Advancement of Science, the president’s proposed budget would lead to some of the deepest cuts for science and engineering research in more than 40 years. Concerns over the funding outlook for scientific research were among issues raised by people participating in the March for Science held April 22. Scientific research is one of many program areas, including veterans benefits, infrastructure, environmental protection and poverty assistance, in which a significantly greater share of the public now backs increased government spending than did so in 2013. Partisan divides over budget issues are not limited to scientific research. Republicans are less likely than Democrats to back increased spending on 11 of the 14 program areas in the survey. There are two areas where Republicans are more likely than Democrats to support federal spending increases: military defense and anti-terrorism spending.